Which Masquerade Mask to choose? I am always asked by customers, ‘which masquerade mask would you choose?‘ Not a simple answer, purely because there are so many designs and styles to go for. However, there are a couple of things that I personally would look at, which are comfort and being unique. The latter is the most important to me as I believe that the mask represents who we are – a kind of expression of the hidden self, so for me, wearing a unique mask is a must as I don’t want to turn up with someone else wearing the same thing. But if this isn’t as important to you, then perhaps you have other things to consider such as budget, comfort and colour scheme. The first thing I would say is to assess the type of ball you are going for. 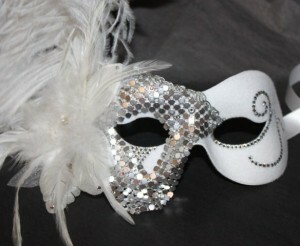 Is it more of a contemporary masked ball or a traditional venetian masked ball complete with costumes? 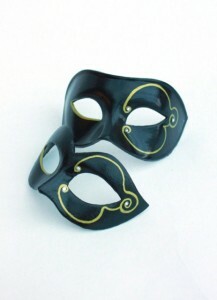 If it’s the latter, then you would probably want to go for more of a traditional style venetian mask which is made from paper mache and can be as decorative or as plain as you prefer. My experience with wearing a traditional mask for my wedding day however, was that some can be quite heavy and I ended up putting blister plasters on the inside of the mask to stop it rubbing on my nose. They are stunning and do make great decorations for your walls after the event and, if you’re only going to be wearing it a short time, then it shouldn’t be a problem. Most of the traditional masks you will see at cheap prices are replicas, likely made in China, made from a resin or plastic base. 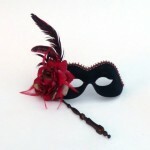 It’s a great way of getting the look for less but expect to pay at least £15 for an authentic basic Venetian mask. 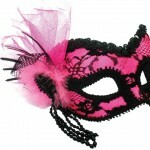 If you are attending a more contemporary black tie masked ball, then you are pretty much free to choose any type of mask. 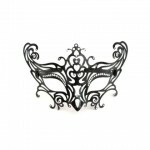 Masks can start from as little as £6 for a cheaper party mask (if you’re on a tight budget) right up to £200 for an amazing Venetian filigree mask. How to choose a mask for this type of ball? If you have a budget, then browse a couple of sites to see the types of masks that fall into that price bracket. You may be surprised at what you can find for a modest sum though. A few sites, (obviously including my own), decorate masks themselves and can produce a gorgeous mask for little more than a cheap party one you find in a fancy dress shop. These will usually be better made and less ‘over-produced’. The simpler the design, the cheaper the mask of course. 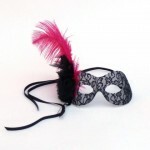 If you are thinking huge ostrich feathers on mask with Swarovski crystals and delicate laces, then be prepared to pay a bit more for something that will make you stand out in the crowd. mask so it can be designed completely to compliment your outfit or at least, make you the only person in the world to be wearing that mask. Some sites will charge for this service, quoting prices from £40 upwards, whereas others will do it for no extra charge. 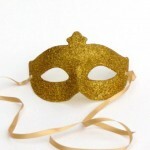 There are no only masks that tie with elastic or ribbons around the face, but you can also buy stick masks (some on longer wooden sticks and others on folding plastic sticks), masks that are worn like a pair of glasses and masks with a headband which are perfect for those who wear glasses. Do you want to be wearing a mask all night? Would the design you have chosen be too heavy for your face and you think a stick mask might be better? Can you cope with holding your handbag, drink and mask in your hand if you used a stick mask? These are a few final questions you should ask yourself before deciding on the type of mask to buy. Personally, I don’t choose to sell full face masks because I don’t think they are practical for wearing to a party as you can’t talk clearly through them or drink or eat -and let’s be honest, what type of party would it be without the above! I hope my guide has helped you with a starting point to choosing your mask, but if you would like to know anything else or need further advice, then please feel free to call or e-mail me with no obligation to purchase.